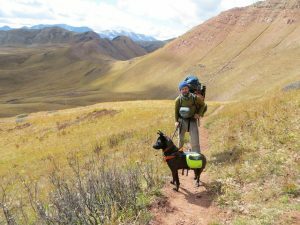 Austin and his dog Summit have walked a lot of miles together, including the Maroon Bells Wilderness. In a few sentences, describe who you are, give us some background about yourself and what you like to do for fun on your time off all year. 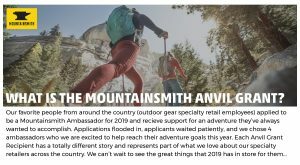 After a southbound Appalachian Thru Hike, I worked seasonal summer jobs and would buy a plane ticket every October to another country for the winter in pursuit of trails I had heard about. The first year I bought a car in New Zealand and drove all over the islands hiking every trail I could find. 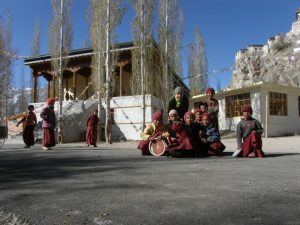 The next year, I followed snow leopard tracks in Ledakh India, hiked the Annapurna Circuit in Nepal and kept moving east until money had run out. 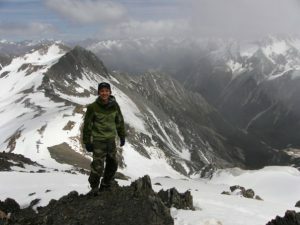 The following year I explored the Cordilla Blanca range and the high cloud forests of Peru. I decided to put my passport on a shelf and adopted a dog who I aptly named Summit. Although we still occasionally hike I’ve found Canoeing to be my new favorite mode of adventuring. I host a youtube channel called Guide You Outdoors, have a small wild edibles company called Tree to Tea and love a good yard sale. You’ll find Austin cheesin’ on sunny peaks around the world… Avalanche Peak, NZ. What is the trip you have planned for your Anvil Grant sponsored trip? When? When I started my thru hike of the Appalachian Trail I had just graduated college and hadn’t been on a backpacking trip since my first, which was in middle school. 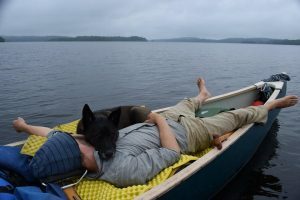 I entered Maine’s 100 mile wilderness with 52 pounds on my back and really no idea what I was getting myself into. Needless to say I got beat down and nearly quit… Well, I did quit physically and mentally but there was nowhere to get out. I spent 3 days recouping at Carl Newhall Shelter eating GORP and talking to a brave chipmunk who wanted my GORP. On the 3rd day my legs were starting to feel better and my moral improved with the arrival of other Southbounders. It was relatively smooth sailing to Georgia from there. The 100 mile wilderness is the most beautiful and remote section of the entire A.T. and I plan to revisit it. Hopefully, with the thousands of more miles on my legs, I won’t suffer through it this time and can just take it all in and enjoy it. What are some of your most memorable outdoor experiences, what drove you to love doing what you do? My parents forced me to go on a backpacking trip when I was in middle school as punishment. I fell in love with the novelty of sleeping in a different spot each night and the self reliance being in the woods commits you to. It was this balance of adventure and self exploration that fueled and continues to fuel each new adventure. Through my Youtube channel, 200 field days as a wilderness therapy guide and now working at the best gear store in New England I strive to help others pursue self betterment through an outdoor lifestyle. Any personal goals for outdoor adventures over the course of 2019? 100 mile wilderness, Guatemala, a week or two in a canoe. If you had a plane ticket to one place in the universe to spend 14 days with an unlimited budget, where would you go? What would you do? I would go to Corsica and hike the GR20. It is considered Europe’s hardest long distance trail and the only international trail left on my bucket list.